Many property owners are wondering if their lawns just didn’t wake up this spring from their long winter nap – and many lawns did not. 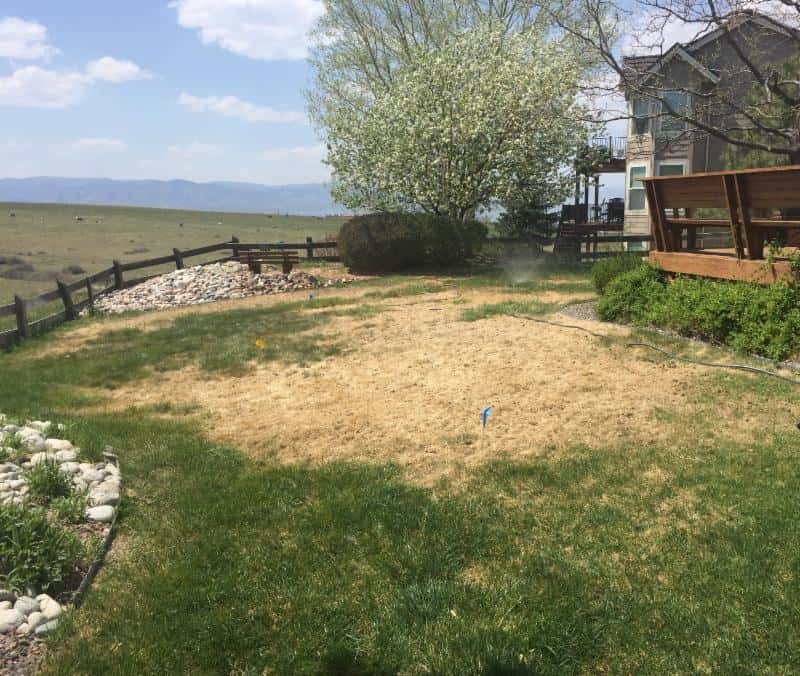 Patches of dead lawn are prevalent along the Front Range due to turf mites. They thrive in dry turf conditions and consequently, are a major problem this year due to lack of winter snow cover and moisture. Lawns that did not receive supplemental water over the winter probably suffered more. Most of the mite damage has been done by now. If the lawn is damaged, it’s not too late to hand water damaged areas to kill any mites that remain. But if areas of the lawn are dead, they will need to be replaced. Other potential lawn problems are just ahead. Be aware of them so if your grass turns to straw, you don’t apply more water and make the problem worse. 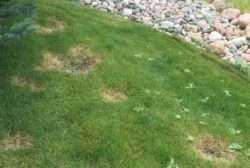 If your lawn suddenly looks “dead,” suspect Ascochyta Leaf Blight. Infected lawns turn straw-colored and this can happen quickly, almost overnight. Our spring conditions could open the door to this turf problem. Ascochyta occurs when we move quickly from cool, rainy periods to the very warm temps like those in the forecast for next week. While lawns look unsightly, the good news is the roots are rarely threatened and extra TLC can help restore the lawn. Since wet conditions drive the blight, it is critical to avoid over watering. Make sure the lawnmower blade is sharp as dull blades damage the lawn leaf. Reduce mowing frequency and raise low mower settings to a height of 3 to 3 ½ inches. With proper care and lack of excessive moisture, the lawn should recover within a couple weeks. Another common and more serious turf problem is “frog eye” or Necrotic Ring Spot (NRS). You may see it in early summer, but it will be most prevalent in July and August when lawns are usually the most stressed. NRS creates circular, doughnut-like patches in the lawn. Because it is a perennial fungus problem that also attacks roots, it is more difficult to manage and can be an ongoing threat. When people see the brown patches in their lawn, they almost instinctively water the lawn more. This is, however, the worst thing to do as over-watering aggravates the problem. Set the mower height to at least 3 inches, avoid cutting off more than 1/3 of grass length at one time and grass cycle clippings on the lawn with a mulching mower. Cut back on fertilizer and provide the highest application of Nitrogen in a slow release form in the fall. Get professional input, particularly if you consider applying a fungicide. Timing is critical and other considerations also apply.